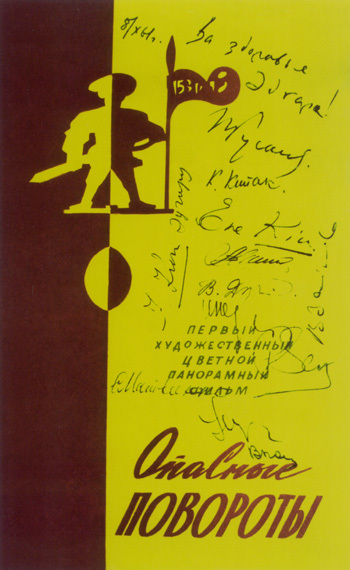 Colour reprint of the original "Opasniye Povoroty" one-sheet signed by the cast and crew for the film's premier in 1961. Reproduced by permission from Fifth Continent, Copyright 2003. Fifth Continent Australia Pty Limited, trading as Kinopanorama Music and Vision, today announced plans for new post-production facilities located in the Central West of New South Wales. “We will be in the position to carry out most work on our special format KINOPANORAMA 3-strip films without having to source independent facilities in Sydney, which is some 4 hours by road from Blayney”, Mr. John Steven Lasher, the company director, remarked today. Fifth Continent has commissioned The Aranda Group in Victoria to design and build special three-lens Kinopanorama film viewers. These will facilitate viewing of the six-sprocket film frames prior to editing. 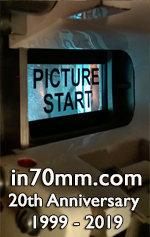 Previously, a six-gang Kinopanorama film synchronizer, with moveable magnetic sound head, was completed by Aranda in 2001. Concurrent with the announcement of the new facilities, Mr. Lasher stated that pre-production work had begun on “The Kinopanorama Experience”, a short subject film aimed at promoting tourism to New South Wales from overseas markets. Location “recess” will take place during April and May, with principal photography expected to commence in early June. This footage, with a voice over and original music, will be transferred to DVD and screened for prospective sponsors and investors before the end of 2003. Train passing bridge in Kinopanorama from the never completed "The Mother Lode". “We also expect to approach various New South Wales state and government film funding bodies for script development and production funds following the investor screening”, Mr. Lasher noted. “It behooves me to think that the producers of the recent IMAX film on Sydney should receive 8-million dollars when our company could produce and even more spectacular film for around 20% of their budget”.